I know that the Archer cast records all of its lines separately, but there are times when the pacing is so great and the banter flies so quickly that I really want to believe that—in the case of tonight’s episode—H. Jon Benjamin and Patrick Warburton are sitting across a table from each other, spitting these ridiculously amusing lines in each other’s faces. That’s a credit to the show’s sound designers, editors, and animators, I guess, that everything in the show flows as well and as hilariously as it does. And “Heart Of Archness, Part 1”—particularly those long scenes that are pretty much just Archer and Rip Riley, sky captain, arguing about the word “ruse” or whether Archer will go back to ISIS or not—flows very nicely for an episode that is, essentially, one long prologue for what’s to come. In fact, I feel a little weird giving this half-hour a grade (though I will, just to be consistent, even though I’d ask you to consider the grade provisional until I see the whole thing). It’s certainly very funny, and it’s certainly a really good episode of Archer and a great episode of television. But it’s also around 22 minutes that consists solely of set-up. I get why the show is doing this big, three-part story (which appears to essentially be Archer: The Movie, just split up into three chunks) as a way to entice viewers of It’s Always Sunny In Philadelphia to stick around and maybe find another show they like just as much as that beloved cult favorite. But it still results in an episode that feels like a part that’s missing the rest of its whole. Or maybe it doesn’t! 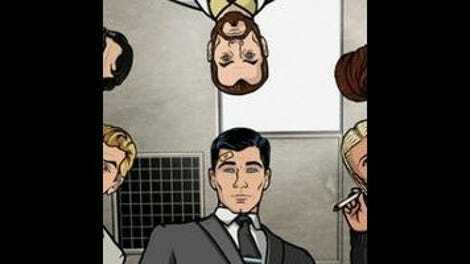 Look at how cleverly the episode sets up a scenario—Rip Riley is going to track down Archer and bring him back to Mallory—that more or less carries out throughout the hour. Rip finds Archer on some far-off tropical paradise, where he’s working as a bartender, growing a sweet beard, and breaking up marriages that are only at the honeymoon stage. (Archer, after all, didn’t even get a honeymoon, thanks to Bionic Barry.) From there, he gets Archer on a plane, headed back to ISIS, but thanks to some typical Archer idiocy, the plane ditches in the ocean, and Archer and Rip drift for a while in a small life raft before getting picked up by pirates—Archer doubts they exist, filing them alongside “cowboys and Indians.” Archer uses some trickery to escape the pirates and in the process seems to be bonding with Rip. But after he kills the Pirate King (no, seriously), he becomes the new Pirate King, as special guest slave pirate David Cross tells him. So now Archer’s going to move to the pirates’ fortress—where the buxom women of Pirate World have prepared a mighty feast—and become the pirate king, even as Rip wants nothing to do with it. Lest I sound like I’m complaining too much, however, I’ll assure you I still loved the episode. I mean, for God’s sake, it had Archer shooting a shark in the frickin’ face, a moment that will surely go down in this show’s history. That epic sweep, honestly, was what I liked best about the episode and what made me happy to go along with the fact that we weren’t spending much time with Cheryl or Pam or Mallory. This episode really does feel like the opening act of a big spy movie, right down to the way the mission objectives—get Archer back to ISIS, land the plane in the water, grab the booze and kill the shark—kept shifting. Each act break introduces an entirely new problem (Rip Riley will find Archer, the propeller has gone out, the pirates have taken the guys), one that rapidly seizes control of the whole narrative, and those problems never feel forced. This is a blockbuster version of Archer, but it’s still recognizably Archer, and the action stuff is all tons of fun. There maybe aren’t as many hard jokes in this episode as in the very best half hours of the series, but the storytelling is surprisingly airtight for something that has to function as both a standalone episode and the first part of a three-part story. And if nothing else, I’m impressed that Archer stuck to its guns in telling the story of the death of Archer’s fiancée. It was a plot development I found a little strange when the show dealt with it at the end of last season, mostly because I guess I didn’t realize the show—with its often arch and sarcastic sensibility—was going for something approaching genuine emotion. But “Heart Of Archness” demonstrates that, no, Adam Reed really does want to see just how much this has messed Archer up. I spent a lot of last season talking about Reed’s commitment to his characters. They consistently remain the same people, and new things we learn about them come to bear on what later happens to them (I certainly hope we get a scene with Pam fighting off 50 pirates at a time). Yet at the same time, Reed never sacrifices the humor in the midst of these moments. Here, he’s telling an essentially serious story about a man trying to get over the murder of his fiancée by avoiding his life entirely, but he’s doing it through the prism of slave pirates and a 1930s sky commander who seems to have traveled through time. Again, it will be somewhat impossible to tell just how good “Heart Of Archness” is until we’ve seen all three parts, but I do, after some thought, quite like how it all started out. I’m eager to see more, and I’m fairly certain that when all is said and done, this is going to be a great story that at once takes its main character’s feelings seriously and also never loses vision of him as the jackass buffoon that he is. Plus, it makes for a fun storytelling experiment for the show, which dabbles in serialization, but has never tried anything as far-reaching as this. If it can pull all of this stuff together, there’s no limit on just how far it can go as it brings this story to the end. I’ve chosen not to watch parts two and three, even though I have them here, so I can be on the same page as you guys. Once the whole thing has screened, I’ll try offering up my thoughts on the project both as individual episodes and as a whole. I kind of hope that FX finds a way to put these three episodes out on one DVD or BluRay as a 65-minute movie type thing. Maybe stuff that was cut could also be restored to pad the running time a bit? OK, there wasn’t much going on in the office—and the office is usually my favorite part—but Mallory’s lengthy, bleeped stretch of cursing was hilarious.